2018 saw widespread media coverage of what has been recognised as a climate of growing political disengagement and distrust in decision making around the world. This two-year project recognises the need for ‘bold and innovative reforms’ that revitalise our democracies and address pervasive issues such as in public trust in governments and their inability to tackle long-term strategic decisions. newDemocracy’s work will aim to support nations at all levels of development to apply the principles and practice of deliberative democracy and put people at the centre of their political systems and decisions. The project includes the development of a handbook (an ‘actionable’ guide to democracy beyond just voting), establishment of an international ‘practitioner eco-system’ and the delivery of three demonstration projects that exemplify how deliberation and democratic innovation works in practice. What are the ultimate impacts that you’re aiming for? Ultimately, the aim of the project is to establish ecosystems that partner practitioners and governments, enabling them to undertake their own projects without newDemocracy’s close oversight. We have a key aim here to establish a high-quality standard where governments place an emphasis on judgment rather than opinion. In 5 years-time, these ecosystems should spread out regionally from the original demonstration projects. There are a few things that make this project unique. It is a big step for a UN democracy body to recognise a need beyond elections. 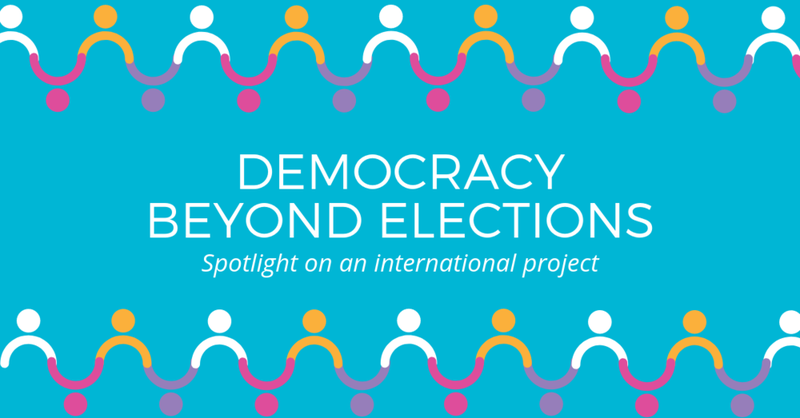 This project is an opportunity to (literally) write the book on democracy beyond elections. We have the chance to establish and demonstrate best practice when it comes to deliberative processes. It is also a chance to test our model internationally. Finding different, complex contexts to apply our principles sharpens our understanding of what does and does not work. Will the handbook provide advice that can be adapted to different types and scales of deliberative process? In short, yes. These processes are all about context. Democracy is really local communities making decisions that they can live with. For this reason, each and every project must be bespoke, taking into consideration the topic, community and circumstances surrounding the public decision. The handbook explains core principles of deliberative processes and how best they can be utilised in various situations which helps people ask the right scoping questions early. What types of issues or dilemmas will you be looking to address through the demonstration projects? We’re looking for a variety of resonant problems where other MPs see a similar scenario of a hard problem they also experience. The handbook explains principles and gives examples of their implementation, the demonstration projects are an extension of this – real world examples of the different aspects of deliberative processes. This will range from diversity of topic, to geography, to level of government. The project includes development of a ‘practitioner ecosystem’ – what size of network are you looking to create in each location and will these ‘trained’ practitioners be involved in the demonstration projects? In terms of size, we’re aiming for a network that’s big enough so that governments have the requisite experience to rely on when running projects. We will have a core facilitation team for each demonstration project. They will be chosen with an emphasis on their prior experience or capacity to complete the demonstration project. In addition, we will run training workshops both in-person and online. These workshops will aim to include as many local and regional facilitators as possible. We’ll encourage everyone to attend meetings as observers and get as much exposure to running a room as possible. Building this network is critical to capacity building in these communities, so we must also pair this with an emphasis on the strong success of the initial demonstration project itself. Hands on experience is the best learning tool. The demonstration projects are anticipated to be held in developing countries, what differences do you think you will see in this context compared to the processes you undertaken previously? Each country and culture has different relationships to their political leadership. This can have an effect on everything from participation response rates, trust in the integrity of the process itself or even a rejection of a role for these kinds of processes. One of the challenges with taking on these demonstration projects will include rapidly becoming familiar with the local political and cultural dynamics that will impact the above process design aspects and more. Other aspects specific to developing countries might be differences in literacy rates, communication norms, ease of travel, and financial compensation. Local knowledge on how these measures impact rates of participation or equity of involvement in the room will be important. What can interested people do to support the project, stay updated or get involved? The best way to stay up to day is keeping an eye on our project page. We will continue to update the page as each demonstration project takes shape. The best way to support the project is to tell people about it, specifically your own political representatives. Australian innovation in democracy is an exciting export but the more projects we run domestically the more we can improve our own democracy.